Manchester United manager Louis van Gaal says he signed Victor Valdes knowing the former Barcelona goalkeeper will not be happy being back-up for fellow Spaniard David De Gea. 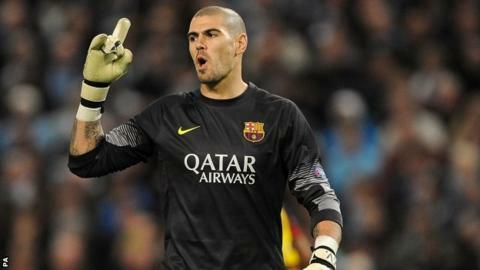 Valdes, 32, has signed an 18-month contract at Old Trafford. De Gea, 24, won United's player of the year award last season. "Nobody is happy to be number two and Victor has to have ambition to beat David De Gea - but it shall be very hard for him," said Van Gaal. Valdes had been training at United as he recovered from a serious knee injury. De Gea has 18 months remaining on his present deal with United after signing for the club in 2011, but he has recently been linked with a move to Real Madrid. However, the United boss says he will extend the player's terms with the club rather than succeed the 33-year-old Iker Casillas at Real. When asked if he thought De Gea would stay, Van Gaal said: "I think so, yes. There is no problem for him to sign." The Dutchman also does not see an issue with having two full Spain internationals in his squad fighting for one position. "My ambition is that I have the best players who can collaborate with each other to form the best team in the world," he said. "When we invited Victor in to have his rehabilitation at Manchester United, we did it for him and ourselves, so I could see if his quality is also still the same. He has confirmed both." Valdes' arrival on a full-time basis is likely to mean the exit of previous back-up goalkeeper Anders Lindegaard. Unbeaten in 11 games, United play Southampton with their manager able to pick from a virtually fully fit squad for the first time this season. "We only have one player injured. Can you believe it?" said Van Gaal. "I have to select, for the first time in my career at Manchester United, the 11 players and the 18." Van Gaal confirmed England winger Ashley Young would be missing for between four and six weeks with a hamstring injury.